Team B won the competition with the team working well together and beating all opposition that came their way, including a 15-0 thrashing of one of the BFC teams. This was a vindication for all the hard work and training drills that the fencing club has put in over the year. Team A also performed strongly winning four encounters. Beth Stanton competed in her first competition as a foillist, and Ben Phillips pulled off the best feat in the competition by bringing the team back from an 8 point deficit to win their final match. Julie Foster as the highest ranked female foillist in the competition won the regional Angela Roberts Trophy, an honour that she is no stranger to. This is an excellent result for the end of the year and we hope that 2011 will bring us more silverware. Highlights: All the teams fought really well with the abilities shining through throughout the day. Even so some mentions must be made for some exceptional performances. David Swan fought brilliantly in sabre considering he had not slept night due to unforeseen circumstances. To turn up was great; to perform as he did winning more than half his fights was even better, even if he was standing on caffeine and adrenaline. 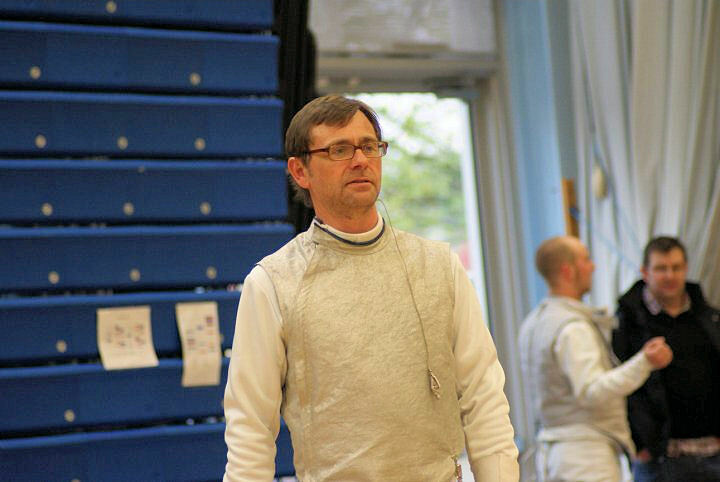 Gavin Rudge came out of the initial pools ranked third and pulled off the only victory against the strongest fencer in the competition FIE ranked David Alexander, who had it not been for Suttons most mischievous fencer, would have walked away with the best foilist title without dropping a fight. Gavin has been working for a long time for many years on how to win bouts to five points, and its seems to be working. Julie Foster and David Cox provided brilliant examples of how in team fencing the last fencer nearly always has to battle to the last, providing nail biting finales to assaults. The silverware this time came from team A:Badgers; who lost the aptly named Stourbridge ‘Squirrels’, long time rivals of Sutton. After very tightly fought epee and foil bouts the score line was a mere 4-9 lead for Sutton after twenty minutes; (maximum score line could have been 19-19). In the end David Cox faced a long and arduous fight to 30 Points against GB veteran sabreur Steve Potter, with Sutton narrowly losing 24-27. Next Time Squirrels, next time!